The air was hot and muggy. The all too familiar smell of exhaust assaulted my senses, it was hour two of waiting for the containers to arrive at the warehouse. It seems like life in Haiti models the same kind of wait people get back home, hurry up and wait. Life in North America is busy and many people get frustrated about the time spent in line-ups and in waiting rooms. I hear comments of “my time is worth is money” “it is disrespectful to make me wait” “ why do they schedule appointments every ten minutes” and so forth. But to read between the lines for most people it is the fact that they have their own schedules too full. Their day is so regimented by the day timer that time makes their world go around. 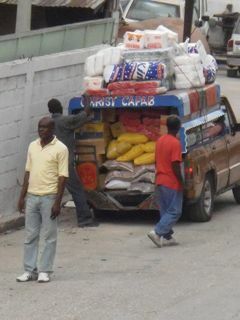 In Haiti an event centered culture waiting is inevitable. 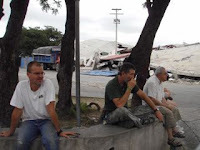 So far today we had waited two hours for the containers to arrive at the warehouse that would be the sorting point for smaller trucks to deliver the relief up the mountain. 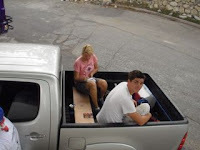 The entertainment from our roadside perch was free, small pickups laden down with more than they could carry, sparks and scraping sounds as they exited the driveway. I could not imagine how they would ever make their destination point but was reminded this is a daily occurrence. Large container trucks unloaded rice, beans, spaghetti; flour, corn meal, and then ladies carried what they could on their heads and smaller vehicles lined up. Now I suppose by hour two we had created a small interruption as many that had seen us when they went in, saw us still sitting from our corner perch hours later. Praise the Lord John was able to park the truck under a huge flamboyant tree. We had been fed, watered and were shaded what more could we need? For me waiting was not as bad as for some, it was 35 degrees C or 102 degrees F and the air seemed heavy. There were grim reminders of the earthquake, fallen buildings, and papers from a filing cabinet of people that had applied for jobs there in I1. There were security fellows with guns at every building and at every corner, which in hindsight maybe the one fellow thought he should stick around and see that we were kept safe as he stayed all day. - A Brinks truck full of ….money ??? - a man with a wheelbarrow of 7 UP in glass bottles full one way, empty on the return trip. - a huge assortment of t shirts in English…”I attended the inauguration of Barrack Obama” my fave. If nothing else people gave us big smiles, there were more bugs then up at the mission, and we bonded as a group over the real appreciation for reliable vehicles. Our day could best be summed up by the painting on one truck “Pale M’ap Travay” roughly translated you sit and talk and I am working. Yep, he was working and we just sat and watched the world go by, discussing once every hour the situation and the need for patience. At 330pm over four hours later when the warehouse was closing, we went home, no containers had arrived….maybe tomorrow. I'm sure there were times during the wait that got frustrating, but what a (hidden) blessing to sit there and get the chance to just people watch in Haiti. With life so busy there and the need so great, the chance to just sit and watch seems rare. Hope you found many opportunities to laugh and have fun in the waiting - wish I could have been there!! But truth be told, it's probably baby oil - they heard about your slip 'n slide idea and want in on the fun!